My dear friends, this is a very simple text indeed. It says, 'Look.' Now lookin' don't take a deal of pain. It ain't liftin' your foot or your finger; it is just, 'Look.' Well, a man needn't go to College to learn to look. You may be the biggest fool, and yet you can look. A man needn't be worth a thousand a year to be able to look. Anyone can look even a child can look. But then the text says, 'Look unto Me.' Ay!" said the preacher, in broad Essex, "many on ye are lookin' to yourselves, but it's no use lookin' there. You'll never find any comfort in yourselves. Some look to God the Father. No, look to Him by-and-by. Jesus Christ says, 'Look unto Me.' Some on ye say, 'We must wait for the Spirit's workin'.' You have no business with that just now. Look to Christ The text says, 'Look unto Me.'" Then the good man followed up his text in this way: "Look unto Me; I am sweatin' great drops of blood. Look unto Me; I am hangin' on the cross. Look unto Me; I am dead and buried. Look unto Me; I rise again. Look unto Me; I ascend to Heaven. Look unto Me; I am sittin' at the Father's right hand. 0 poor sinner, look unto Me! look unto Me!" by Charles Spurgeon | Reprinted from C. H. Spurgeon: The Early Years (Banner of Truth), pp. 86-88, 99-100. 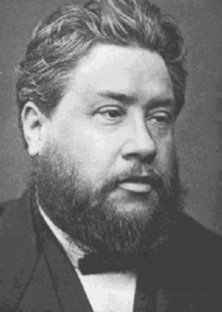 Charles H. Spurgeon was born at Essex, England, June 19, 1834; led his class at every examination in school at Colchester; converted December 15, 1850; preached first sermon 1851 at age 16; became a pastor in 1852; published more than 1900 sermons in his lifetime; died 1892, he was mourned by thousands. I had been about five years in the most fearful distress in mind, as a lad. If any human being felt more of the terror of God's law, I can indeed pity and sympathize with him. Bunyan's "Grace Abounding" contains, in the main, my history. Some abysses he went into I never trod; but some into which I plunged he seems to have never known. I thought the sun was blotted out of my sky--that I had sinned so against God that there was no hope for me. I prayed - the Lord knoweth how I prayed, but I never had a glimpse of an answer that I knew of. I searched the Word of God; the promises were more alarming than the threatenings. I read the privileges of the people of God, but with the fullest persuasions that they were not for me. The secret of my distress was this: I did not know the gospel. I was in a Christian land, I had Christian parents, but I did not fully understand the simplicity of the gospel. I attended all the places of worship in the town where I lived, but I honestly believe that I did not hear the gospel fully preached. I do not blame the men, however. One man preached the divine sovereignty. I could hear him with pleasure; but what was that to a poor sinner who wished to know what he should do to be saved? There was another admirable man who always preached about the law; but what was the use of plowing up ground that needed to be sown? Another was a great practical preacher. I heard him, but it was very much like a commanding officer teaching the maneuvers of war to a set of men without feet. What could I do? All his exhortations were lost on me. I knew it was said, "Believe on the Lord Jesus and thou shalt be saved," but I did not know what it was to believe in Christ. I sometimes think I might have been in darkness and despair now, had it not been for the goodness of God in sending a snowstorm one Sunday morning, when I was going to a place of worship. When I could go no farther, I turned down a court and come to a little Primitive Methodist chapel. In that chapel there might have been a dozen or fifteen people. The minister did not come that morning; snowed up, I suppose. A poor man, a shoemaker, a tailor, something of that sort, went up into the pulpit to preach. Now it is well that ministers should be instructed, but this man was really stupid, as you would say. He was obliged to stick to his text, for the simple reason that he had nothing else to say. The text was "Look unto Me, and be ye saved, all the ends of the earth." He did not even pronounce the words rightly, but that did not matter. There was I thought, a gleam of hope for me in the text. He began thus "My dear friends, this is a very simple text indeed. It says 'Look.' Now that does not take a great deal of effort. It ain't lifting your feet or your finger, it is just 'look.' Well, a man need not go to college to learn to look. You may be the biggest fool and yet you can look. A man need not be worth a thousand a year to look. Anyone can look; a child can look. But this is what the text says. Then it says 'Look unto Me.'" "Ay," said he, in broad Essex, "many of ye are looking to yourselves. No use looking there. You'll never find comfort in yourselves. Some look to God, the Father. No, look to Him by and by. Jesus Christ says, 'Look unto Me.' Some of you say, 'I must wait the Spirit a working.' You have no business with that just now. Look to Christ. It runs: 'Look unto Me.'" "And you will always be miserable in life, and miserable in death if you do not obey my text. But if you obey now, this moment you will be saved." Then he shouted as only a Primitive Methodist can: "Young man, look to Jesus Christ!" I did "look." There and then the cloud was gone, the darkness had rolled away, and that moment I saw the sun: I could have risen that moment and sung with enthusiasm of the precious blood of Christ, and the simple faith which looks alone to Him. Oh, that somebody had told me that before. TRUST CHRIST, AND YOU SHALL BE SAVED. Remember, dear brother, if you give your whole soul to the charge committed to you, it does not matter much about its appearing to be a somewhat small and insignificant affair, for as much skill may be displayed in the manufacture of a very tiny watch as in the construction of the town clock; in fact, a minute article may become the object of greater wonder than another of larger dimensions. Quality is a far more precious thing than quantity. —Pastor Charles H. Spurgeon; An All-round Ministry, p. 70.